Santa Monica is an affluent beachfront suburb of Los Angeles that sits on the shore of Santa Monica Bay. By land this city of about 90 thousand Americans is surrounded by L.A., and Santa Monica is the home of the famous carousel, the Santa Monica Looff Hippodrome – now a National Historic Landmark. If you're visiting Santa Monica on vacation, it's a smart and cool idea to book a cheap rental car for your trip. Santa Monica is a great place to have a car, because there are many fun and interesting attractions to see, as well as a lot of great restaurants and shopping opportunities! We charge absolutely no booking fees! There is no charge for cancellation up to 48 hours before departure. Compare with us and save some bucks today! Feel safe entering your personal info on our secure website! It has SSL (Secure Sockets Layer) encryption. It's fast, easy, quick, easy, time-efficient… and did we mention easy?! 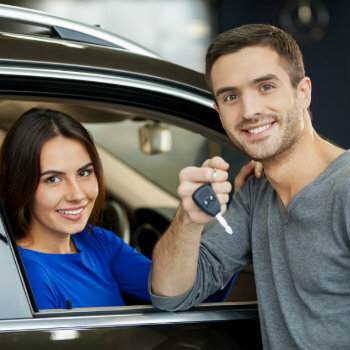 When you book your next rental car early, you will usually get a really great deal! We'll match any price using our Price Promise page! Check the Price Promise page to get the details. What's so great about driving a rental car in California? Once you've picked up your cheap car rental, all of Santa Monica is yours to see and enjoy! Drive over to the famous McCabe's Guitar Shop – it's been a leading acoustic performance space for decades, as well as a retail outlet. Or, check out Bergamot Station, which is a city-owned art gallery and home to the Santa Monica Museum of Art. Last but not least, the city is home to both the California Heritage Museum, and to the Angels Attic dollhouse and toy museum. Those are great places to visit, and your rental car makes it so easy to get there and get back to your hotel or other lodging. Let's be serious, now. You probably want to do at least a little shopping in Santa Monica, am I right? Well it's important to know that Santa Monica's 3 main shopping areas are the north side's Montana Avenue, Downtown Santa Monica, and Main Street on the south end! Montana Avenue is famous around Greater L.A. for its stretch of luxury boutiques and fine restaurants. If you drive your cheap car rental to Downtown Santa Monica, you can park your car and check out the Third Street Promenade, the city's major outdoor shopping mall. Main Street is kind-of “funky” and offers that fun, eclectic selection of clothes and restaurants that are both wonderful and unique. You absolutely shouldn't compromise between quality and price in Santa Monica! Santa Monica is a beautiful coastal town located in the western part of Los Angeles in California of the U.S.A. The city bears an exquisite scenic landscape as it is surrounded by Pacific Palisades, Brentwood, West Los Angeles, Mar Vista and Venice. Owing to its extremely pleasing climate, Santa Monica has now become one of the frequently thronged destinations in California. The Santa Monica Museum of Art is a wonderful museum which exhibits numerous works of local, national, and international artists. Founded in 1984, the art museum currently displays both permanent and temporary art collections. Palisades Park is a natural wonder within Santa Monica. Visiting this place is a great idea for long walks with your spouse or kids, while you admire the scenic view of the ocean. Santa Monica Beach is a spot not to be missed if you are looking for outdoor recreation. It includes activities for both adults and children. The Santa Monica Film Festival is one of the most important events hosted by this beautiful city. The festival manages to draw thousands of visitors every year. It was founded in 1996. Third Street Promenade is considered to be the best public attraction in downtown Santa Monica. The shopping district is a must-visit for all tourists on vacation in this wonderful area of California. The promenade is filled with shops, restaurants and recreational spots. Historic walking areas and cultural venues like theaters are found here. Fritto Misto is a great Santa Monica restaurant. The food here is absolutely delicious, while all specialties are fresh and really affordable. Fresh pasta, vegetarian food, and also American and Italian specialties can be tasted here. 1. Visit the Santa Monica Looff Hippodrome: This National Historic Landmark was built in 1909 on the Santa Monica Pier. The La Monica Ballroom is one of the largest ballrooms in the entire country. The pier consists of an amusement park called Pacific Park. The ferris wheel, carousel, aquarium, shops, arcades, pub and restaurants are the highlights of the Pier. 2. Do not forget to visit Santa Monica Civic Auditorium: It is a multipurpose convention center in Santa Monica that was constructed in 1958. The area of the auditorium is extremely spacious and was built keeping in mind various sporting events, concerts and meetings held there. 3. Explore the happening Bergamot Station: Bergamot Station is a facility comprised of many arcades and art galleries in Santa Monica. The station used to be a stop for the Pacific Electric rail system from 1875 to 1953. The place has now been transformed into an art gallery complex besides being a cultural destination. 4. Indulge in some shopping on Third Street Promenade: It is a pedestrian street known for its shopping centers. This outdoor shopping destination consists of Starbucks Hear Music Coffeehouse, Mann Theatres, Loews Theatres, and a farmers' market. 5. Get amused at Majestic Theater: This theater is also known as the Mayfair Theatre, which was opened in 1912 and has filmed numerous documentaries, plays and movies. Avis West Los Angeles/brentwood - 11901 Santa Monica Boulevard, West Los Angeles, . Budget West Los Angeles - 11901 Santa Monica Boulevard, West Los Angeles, . Feedback: Your site is fantastic. Linking the maps to the rental sites is brilliant!